Good morning! Did you have a fun and productive weekend? I tackled my magazine problem.. well part of it. 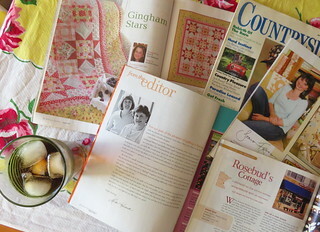 Remember back in the olden days when magazines where how you found out anything that was going on in the quilting world.. well it was for me anyway. I went through tons of them looking to see if I could figure out why I had saved them. Lots of projects look very similar to projects of today, just new fabrics and colors. Saw some friendly faces and places. And remember how wonderful Countryside magazine was? I found quite of few of those that I had saved just because they were so pretty. Different times. But still lots of the same faces we know and love now. I'm curious how we'll remember the things we love now and are pinning on Pinterest or saving on hard drives.. will we still have those ideas like we have the magazines? And will we care? Maybe that's old lady talk. Still, it was a lot of fun going through them. Happy week people! I have always had a magazine saving problem. Remember Seventeen magazine? Over the years I've cleared them out. Now I have a problem with keeping Stampington Mags. "Sew" is one I can't throw out. Especially because they cost $15!!! I loved Country Home and Country Gardens. I have a hard time throwing out magazines too. 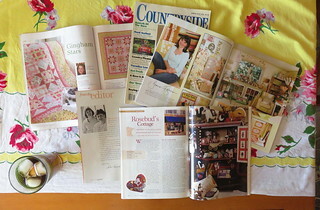 I have been getting better about scanning the patterns I want and passing the magazine on. 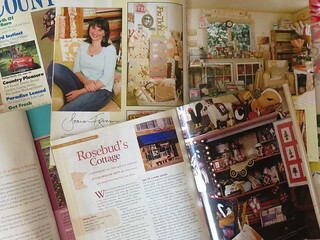 All my hobbies can be found in the magazine collections that I keep. However I have recently purged quite a bit of my collections and made room on my book cases. At my quilting clubs and classes we give away to each other. I started with that project several years ago but got side tracked.I have finally decided to just toss them because I couldn't find a simple way to pass them along. And I will never make all the patterns and ideas I have either. I too love saving magazines, and find it very hard to throw them away. I have most of them nicely organized in binders using those long plastic tabs that slip into the middle of the magazines and enables them to be put into a binder. I felt I would bring them out more often this way and re-look at them but......! I know how you feel!! I've been doing the same thing. I have magazines going back to the early 90s. I was surprised at how many patterns are being remade with a new name and new fabric. I wasn't surprised about how much my tastes have changed. It's been fun and messy.